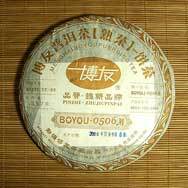 The taste and characteristics of this tea closely resemble that of Menghai 7262's, which is no surprise considering that Boyou.0506M is created based on Menghai Tea Factory' renowned 7262 formula. 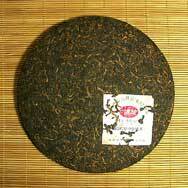 The tea cake is compressed using 6th grade tea leaves harvested from Menghai areas. I am rating this tea in December 2015 so it has aged for almost eight years. It has the distinctive scent of brine, but not overpowering. It has a smooth Pu´re flavor with a spicy after taste. 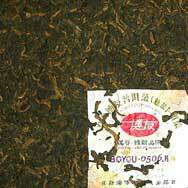 It is a medium bodied tea with a medium color. Overall the flavor and drinking experience is excellent. Sweet, quite rich and probably ageable.